Notable children’s book illustrators have generously drawn upon their talents to support the California Campaign for Strong School Libraries. Aliki, Caroline Arnold, Joe Cepeda, Marla Frazee, Kazu Kibuishi, Brian Selznick, and Marianne Wallace created illustrations for the cause. 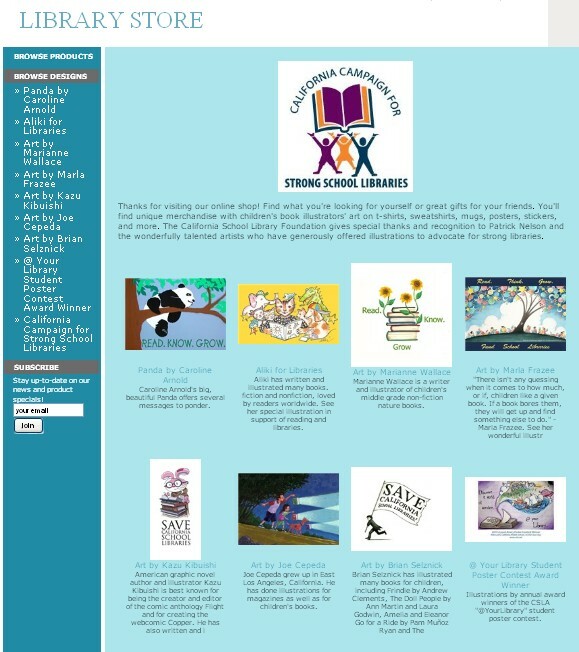 The public can view the images and support school libraries when they visit the Campaign’s LIBRARY STORE. California School Library Association members praised the artists and school library “Best Seller” Patrick Nelson for stepping forward. Southern California librarians asked for T-shirts, so now there are lots of t-shirts available with the Childrens Book Illustrators images, each with the message: "Strong School Libraries Build Strong Students and Lifelong Learners". There are lots of choices, so buy a bunch. Get one in every color and shape. Get some for your family and grandparents, too! Get matching note cards to reinforce your message.